Born May 7 18551,2,4,5,6,9,12,13,14,15,16,17,18 [May 7 18547], Richland MM, Keokuk County, Iowa1,2,4,5,6,9,12,13,14,15,16,17,18. He married Frances Ann Whistler1,2,7,13 [Francis Wisler10], Mar 26 18791,2,7,13, Richland, Keokuk County, Iowa1,2,7,13. Frances, daughter of William Wisler & Anna Reppert4,9,10,12,13,17, was born Aug 2 18574,9,10,12,13,17 [Aug - 18585, Aug 2 18567], Jefferson County, Iowa4,9,10,12,13,17. Hinshaw, Alpheus, age 25, born in Iowa; father born in Tennessee; mother born in North Carolina; farmer. Hinshaw, Frances, wife, age 32, born in Iowa; father born in Pennsylvania; mother born in Ohio; keeping house. Alpheus M. Hinshaw, age 39, born in Keokuk County, Iowa. Frances A. Hinshaw, age 37, born in Jefferson County, Iowa. Wayne Hinshaw, age 13, born in Hardin County, Iowa. Lake Hinshaw, age 11, born in Hardin County, Iowa. Leonard Hinshaw, age 9, born in Hardin County, Iowa. Elsie Hinshaw, age 7, born in Hardin County, Iowa. Daisy Hinshaw, age 4, born in Hardin County, Iowa. Fay Hinshaw, age 1, born in Marshall County, Iowa. Hinshaw, Alpheus, head-of-household, age 45, born May 1855 in Iowa; father born in Tennessee; mother born in North Carolina; married 21 years; occupation: farmer; owned farm (mortgaged). Hinshaw, Francis A, wife, age 41, born Aug 1858 in Iowa; father born in Pennsylvania; mother born in Ohio; married 21 years; 7 children, 6 living. Hinshaw, Wayne, son, age 17, born Dec 1882 in Iowa; parents born in Iowa; occupation: farm laborer; attended school 4 months. Hinshaw, Lake, daughter, age 15, born Sept 1884 in Iowa; parents born in Iowa; attended school 5 months. Hinshaw, Leonard, son, age 14, born Jan 1886 in Iowa; parents born in Iowa; attended school 4 months. Hinshaw, Elsie, daughter, age 12, born Mar 1888 in Iowa; parents born in Iowa; attended school 7 months. Hinshaw, Daisy, daughter, age 9, born Oct 1890 in Iowa; parents born in Iowa; attended school 7 months. 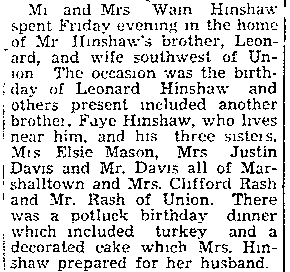 Hinshaw, Fay, son, age 5, born Oct 1894 in Iowa; parents born in Iowa. Hinshaw, Alpheus M, head-of-household, age 54, born in Iowa; father born in Tennessee; mother born in North Carolina; first marriage, married 31 years; occupation: farmer, general farming; owned farm (mortgaged). Hinshaw, Frances, wife, age 52, born in Iowa; father born in Pennsylvania; mother born in Ohio; first marriage, married 31 years; 7 children, 6 living. 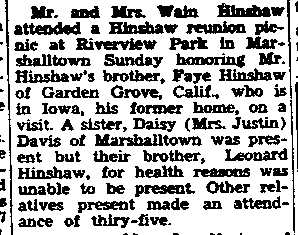 Hinshaw, Daisy, daughter, age 19, born in Iowa; parents born in Iowa. Hinshaw, Fay, son, age 16, born in Iowa; parents born in Iowa; occupation: farm laborer, home farm. Hinshaw, Alpheus M., head-of-household, age 64, born in Iowa; father born in Tennessee; mother born in North Carolina; owned home; occupation: none. Hinshaw, Frances A., wife, age 62, born in Iowa; father born in Pennsylvania; mother born in Ohio. Hinshaw, Alpheus M., head-of-household, age 74, born in Iowa; father born in Tennessee; mother born in North Carolina; first married at age 24; owned home ($2500 value); radio in home; occupation: retired. Hinshaw, Elizabeth K., wife, age 62, born in Iowa; parents born in Indiana; first married at age 35. It would be hard to find within the borders of Marshall county a more scientific farmer than Alpheus M. Hinshaw, although he can show no degree from an agricultural college, yet he has been a keen observer all his life and has devoted his attention solely to his vocation and has been a diligent reader of all subjects pertaining to the same, so that a glance over his well tilled, well kept and productive fields is all that is necessary to show that he is a twentieth-century farmer in all that term implies. Mr. Hinshaw was born in Keokuk county, Iowa, May 7, 1855, and he is the son of William and Louisa (Stalker) Hinshaw, the father a native of Tennessee and the mother of North Carolina. The elder Hinshaw came to Keokuk county, Iowa, in 1844, later returning to Indiana, where he was married. In 1846 he located in Keokuk county, purchasing one hundred acres of good land, where he spent the rest of his life engaged in farming, his death occurring on October 11, 1885, his wife having passed away in 1863, when the subject was a young boy. They were the parents of seven children, five of whom are living. William Hinshaw was twice married, his last wife being Sarah Crakaal, by whom four children were born, all deceased. In politics he was a Republican and he served his township as clerk and trustee. He belonged to the Friends church. Alpheus M. Hinshaw was reared on the home farm and educated in the public schools and he has made farming his life work. He came to Marshall county in 1892 and bought ninety acres of good land, on which he has placed about all the improvements and made one of the choice farms of its size in the township. On this he raises a diversity of crops and all kinds of live stock. He has a very pleasant home. He lived in Hardin county eleven years, and he served as clerk of Concord township two terms, performing his duties very faithfully. In politics he is a Prohibitionist and he and his family are members of the Friends church. Mr. Hinshaw was married on March 26, 1879, to Frances Whistler, who was born in Jefferson county, Iowa, August 2, 1857, the daughter of William and Anna (Reppert) Whistler, the father a native of Pennsylvania and the mother of Ohio. They came to Jefferson county, Iowa, in an early day and there his death occurred, his widow living in Keokuk county. To Mr. and Mrs. Hinshaw seven children have been born, namely: Bertha, deceased; Wayne, Lake, Leonard, Elsie, Daisy and Fay. Contribution from Deb Morrison (). 1880 census, Richland Township, Keokuk County, Iowa; roll T9-0349, ED 160, page 200C, line #29, dwelling #135, family #155. 1920 census, New Providence, Providence Township, Hardin County, Iowa; roll T625-492, ED 194, page 10A, line #14, dwelling #30, family #30. 1930 census, New Providence, Providence Township, Hardin County, Iowa; roll T626-658, ED 21, page 1A, line #7, dwelling #3, family #3. Hardin County Index (Eldora, Iowa), Jan 6 1950; http://www.ancestry.com. Hardin County Index (Eldora, Iowa), Jan 13 1950; http://www.ancestry.com. Eldora Herald Ledger (Eldora, Iowa), Aug 18 1953; http://www.ancestry.com.